The day before I was to board a bus from Austin, Texas going South… deep into Mexico… I called up a local hatter who I’d done some photographic work for, Manny Gammage, owner of Texas Hatters in Buda, Texas at the time. Manny had been around the block a time or two, pretty gruff, but he also had a peaceful, monk-like demeanor. We chatted off and on about my Mexican backpacking adventures off the beaten path. Manny to let on too much, but you got the impression he was very familiar with the strange experiences one can have if they dive deep enough into the interior. We hadn’t chatted in a good while, so I gave him a call to let him know I was once again wandering South. You could tell she was fighting pretty hard to be strong and not get choked up, but she was mostly failing. “I’m actually bussing it to Mexico early in the morning. I just wanted to call and let him know before I left. He always seemed to get a kick out of my Mexico adventures. We said our goodbyes as Joella gave up trying to hold back breaking down. Before the call, I’d been elated to be about to embark on another adventure. After the call, I tried to get some of that back, but couldn’t get the sad news out of my head. I mean, there’s nothing I could do and we weren’t really close friends or anything. Just a couple of people who shared some similar interests and had enjoyed swapping stories a few afternoons over about a years time. The bus trip down was a little brutal. I’ve since learned it’s not worth it to knock out long distances in one shot. Much better to take little breaks along the way. Back then it was all about powering through all of the miles at once… then suffering the overwhelming fatigue for a day or so after you get there. I remember leaving Austin, a layover in San Antonio where I was once again reminded of Manny’s lousy luck, then a bus change with all the border hassles, long layover in the Monterrey, Mexico station… even longer layover in the Mexico City station… then an all-nighter on a rough 3rd-class bus, just to get to the foot of the mountain below Huautla de Jimenez, Oaxaca. Huautla de Jimenez, Oaxaca is known for a strange indigenous practice of consuming a particular hallucinogenic mushroom that only grows at high altitudes. There’s a name the Mezatec Indians call the mushroom, that roughly translates to “God’s Meat”, but most just call the mushrooms Derrumbe, or “Mud Slide” which is where they grow. They have very powerful psychoactive effects and the Mezatecas believe that consuming them allows them to commune with God. Even the little children eat them on certain birthdays, with a guide, as a rite of passage. The main mushroom priestess Maria Sabina was visited by a fellow named Gordon Wasson who was doing research on the drug referred to as “Soma” by the ancient Indus people (their texts are what Hinduism is based upon). Nobody knows what Soma actually was, but it was allegedly brought here from the heavens by Vishnu. It was supposed to make the poor man feel rich, and the sick man feel well, etc. Many speculate this Soma substance, depicted in Vedic texts as a tree shape, was possibly a psychoactive mushroom instead. The Indus people dwelled in the mountains, and the Derrumbe mushrooms only grow at high altitudes. The idea that the drug Soma was possibly a mushroom, and possibly the same species that was imbibed by a Oaxacan, Mexico indigenous mushroom cult was also speculated by Gordon Wasson. After Mr. Wasson had journeyed up into the mountains to verify this mushroom cult real did exist, and partake in ceremonies with Maria Sabina, he had several of his papers published by a friend who was the head editor at Time magazine. This was round the late 60’s and early 70’s I believe… right around the time that the article would inspire many hippies of the day to make a bee line for this mystical mushroom cult in the mountains of Oaxaca. Many popular celebrities in the late 60’s like Donovan, Bob Dylan, Timothy Leary, and even the Beatles… all visited this mushroom priestess named Maria Sabina as well. And then even more hippies flooded in. The trouble was, that this was a spiritual ceremony involving a fungus the Mezatecas believed to be God’s meat… given to them in order to commune with the great creator. Unfortunately, the hippies didn’t get that memo and all hell broke loose, with deranged young people fighting each other, running around naked, and… well, you can imagine what else! And, that it didn’t go over so well with the Mezatecas. There’s more to tell of this incredibly exotic and magical place… and I’ll tell you more about it too, but this is just to let you know what some of the backstory of the place I was headed to. There was a time while I traveled in the area of Palenque, Mexico, in the state of Chiapas, where you could stay in a small, open-air hut with a thatch roof, called a “palapa” for about a dollar… hang a hammock and fall asleep with Howler monkeys making this hypnotic echoing snoring sound while the rain fell in the jungle. That place was called Maya Belle, and it’s still there. Only, now it caters less to backpackers traveling on a shoestring, and has a swimming pool, proper rooms with air-conditioning for the more discerning traveler. The original little cafe is now a restaurant with a menu and waiters. Maya Belle is still a nice place, but it doesn’t have quite the vibe it used to when I first started going there. Just down the road are the Mayan ruins of Palenque. Now, there are tons of tourist busses, flying by all day. And basically a small village of tourist gift stalls set up outside of the entrance. But, when I visited originally, you could sneak through the jungle on a small path all the way to the ruins. If you went at night, and didn’t get caught, you could spend all night exploring there under a full moon and even make your way down into the main pyramid Temple of Inscriptions. I’m thinking maybe it’s been nearly 20 years since what I’m about to tell you took place. Or, thereabout. Back then, if you wanted to get a message back home that you’re still alive and what not, you had to catch a collectivo van-taxi into the town to make a call from the telecommunications place. There was this magnificent little place in town that used to roast their own coffee beans every day. Palenque is in the state of Chiapas which as spectacular coffee. Coffee and some sweet bread was all this place had. A couple of flimsy tin tables with chairs, a large coffee roaster, and a coffee machine. Man, this coffee was incredible. I don’t mean just tasty, but it was like a lightning bolt of energy just after the first cup. Your mind would be racing so fast that you’d swear you just learned all of man’s knowledge in one cup. Soon, you’d start sweating profusely for a few minutes. When that wore off, you’d order another cup immediately. Two cups was about the limit, because after two your brain would feel like it was being cut out and eaten while it was still throbbing… Mayan style. Before the coffee, I stood in line at the phone place. When it was my turn I was having trouble understanding the clerk’s Spanish and she was having trouble understanding mine. Twenty years now, and I still can’t speak Spanish fluently, but back then it was really bad. Luckily, there was a short local Mexican man behind me who spoke English. He asked, “Do you need some help?” I told him I did. He translated my request to make a collect call home. He said, “The girl has instructed you to enter phone stall number 4 and pick up the phone when you hear it ring.” I thanked him and carried on with the instructions. I said this fellow was Mexican, but I’m not entirely sure that he was. He was slight and very short. He stood perfectly erect and had almond-shaped eyes. His skin was dark, but his features were more indigenous I think. Hard to pinpoint, but his nose was very large. Not garishly so, but it commanded more attention than the rest of his facial features. Kind of “royal” looking. Those almond eyes were an intriguing close second. After a couple of minutes of silence, I figured he wasn’t up for chatting so much. I drank my cerveza and looked out toward passersby on the street. Glanced back and noticed the fellow has seated himself at my table and looked as if he were studying me. Or, deciding if he was going to tell me what he was about to divulge. He told me things about history, and that some things that seem horrific or wrong at the moment… that when you look at them from outside the timeline… way further out… they often make more sense. You see what happened before that led to that horrible action, and then you see what happens as a residual effect of that action further down the timeline. Most often you can deduce that this one horrible thing had to happen in order for these other greater things to happen. Everything is happening for a reason, and for good reason. He went on to tell me that “his people” could also travel anywhere they wanted with thought alone. And, that it could be taught to others. However, they were very careful about who that taught how to do these things because they could be used for bad intentions. I asked, “So, you could teach me to communicate over long distances with only the mind and travel to anywhere I choose using my mind?” He said, “Yes”. There were a few moments of silence as I thought about this and while he studied my reaction. Until, he broke the silence saying that he had to leave to pick up some things at the market before the dinner hour and would chat with me later. I paid him for the beer and thanked him again for helping me out at the phone center, and even more so for the very interesting conversation. Headed back out to the scorching heat and waved goodbye to the gentlemen from the street. Walked around in a little bit of a daze after that. It was so hot and humid, all I wanted to do was get back to my hammock in the shade of my palapa at Maya Belle and lay there thinking about what we’d talked about. Later that afternoon I was hammock swaying in my palapa when some other backpackers I’d met earlier stopped by. They were curious where I’d disappeared to all afternoon. I told them I had to run into town to make a call home, but that I’d run into a very interesting fellow who’d helped me out translating. They all seemed pretty excited and ran back to their palapas to grab their belongings, and we were off. To be clear, I really had no idea at all. For some unexplained reason, the location of this cafe was escaping me. Maybe it was the heat beating down and radiating back up off the concrete. Maybe it was the beers. Going back to the phone place was a desperate shot in the dark because I was embarrassed that I’d been so confident of it’s location before. Once we got to the front of the phone place, I still didn’t have a clear idea. I remembered the direction we started off, but I we were chatting along the way and I really wasn’t paying attention. So, when we started off from the entrance in the direction we’d walked, I stopped even trying to remember. Sort of switched to a gut feeling or intuition. After about 20 minutes of walking, turning, turning again, then continuing around a corner… I was about to confess I was lost. When at that very moment I looked up and there was the cafe and the fellow standing there greeting is. Whew! The fellow went to the back for drink menus and I motioned for the others to take a seat at one of the two tables. The Australian guy pulled a chair over form the other table and we waited. The others were excited to hear more from this mysterious fellow, as was I, but I was also baffled at how I was able to find my way back to this place after being certifiably lost. The fellow came back and passed out some laminated single page printout menus of the snacks and drinks they served. Everyone just wanted cold cervezas and I confirmed that the Superior cervezas were still the coldest. They just wanted to get on with the good stuff, the mystic secrets… as did I. When he came back with the cervezas, he passed them out then stood by quietly looking out toward the street. At that moment I noticed something that had been nagging me from the first time I spoke with him but couldn’t put my finger on. When you visit Mayan ruins sites, or look at photos of the stone carvings they left behind, you’re struck with one consistent characteristic. They’re almost always depicted in profile, and their noses dominate most of their face. It’s as if the top of the nose doesn’t stop at the bridge between the eyes, but instead continues up into the forehead. It’s a striking look, and this fellow had that very same look. The carvings always appear to have very smooth skin as well, completely free from imperfection or wrinkles. I suppose this is likely the case with most carvings and statues. But, this fellow’s skin also seemed nearly flawless and almond-colored. The majestic nose, the almond eyes, the way he sort of lightly glided as he walked… he looked like what I imagine a Mayan might’ve looked like. He slipped away to the kitchen. The others looked at me with aggravation that I’d made the whole thing up and dragged them into the town for nothing. “Maybe, 3 or 4 hours ago? We came back here and you were telling me about how you communicated with your daughters using thought? We parted ways and I went back to Maya Belle. I thought about what he’d said and that there was nothing I could do to prepare, so I just put it in the back of my head for later. 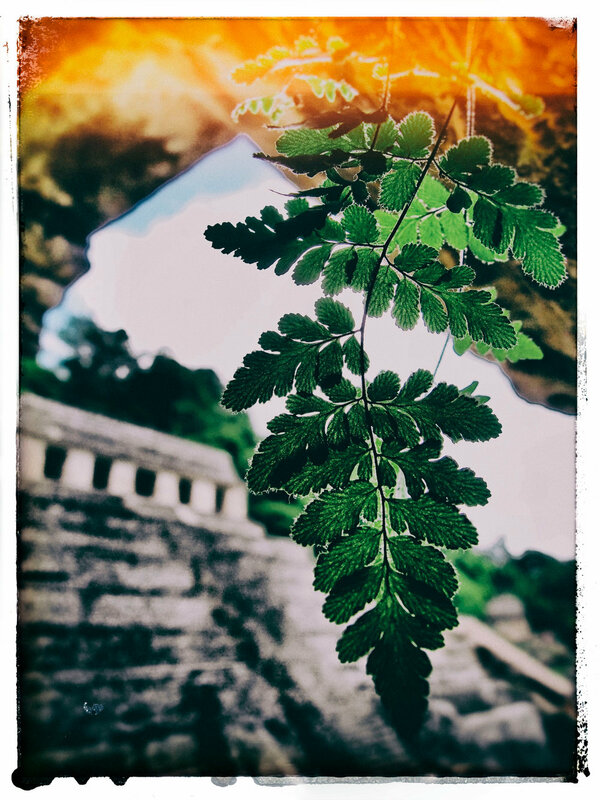 About a year or two later, I was once again traveling in Mexico and had wondered back to Palenque to stay at Maya Belle. I hadn’t forgotten about the experience with the strange Mayan looking fellow and couldn’t wait to get back to his cafe to see if I was finally “ready” to learn more. Again, it took me awhile to find his cafe again, but I did. Took a seat and eagerly waited for the fellow to take my order. Only, it was a different man now. I stepped back on the sidewalk to double check that I was at the right cafe. I walked around Palenque streets for awhile wondering what could have happened to them, or if I’d ever see the fellow again. It’s now been over 20 years since I met the mystical Mayan interdimensional fellow. Strangely, I still think I may see him again one day just as he promised. I only hope that when that happens… this time… I’ll be ready. Been going out into the high-plains region of San Luis Potosi, Mexico... just below Real de Catorce in the desert floor since around 1994. I've got a specific spot I like to go to. It's only about 45min hike from the small town I rent a basic/primitive adobe room in. 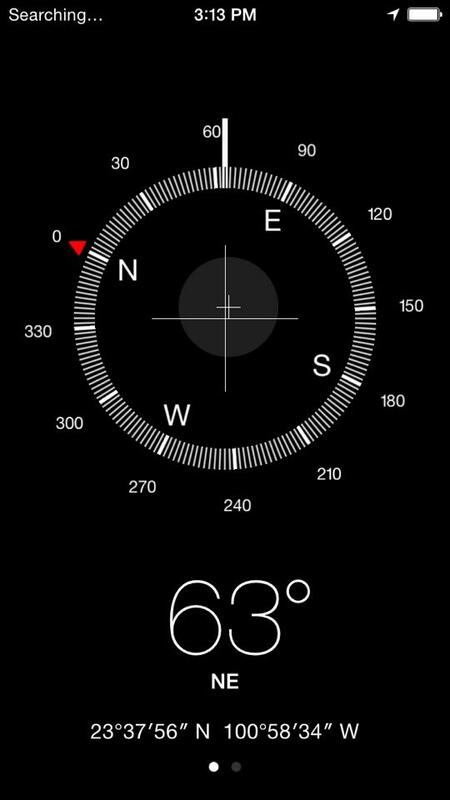 If the weather turns on me, not that far to get back to shelter. There's a mesquite tree nearby for shade when the sun gets too intense, and a little shelter from rain. An old dusty burro cart track gets you most of the way there, then goat trails help get you the rest of the way without too many cactus spines stuck in your body parts. The backdrop is great too. A mountain, also sacred to the Huichol Indians. Every 3 years years, it's required that the head of each family must make a pilgrimage from their tribal area in the state of Nayarit, to the top of this mountain they call "Quemado". 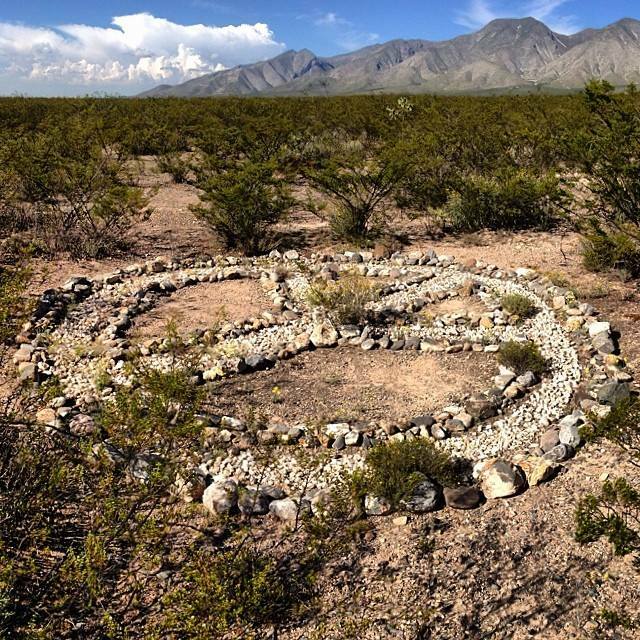 They believe they must perform peyote or "jikuri" ceremonies at various points along the way and at the top of Quemado, in order for the sun to continue to rise, as well as various spiritual reasons. 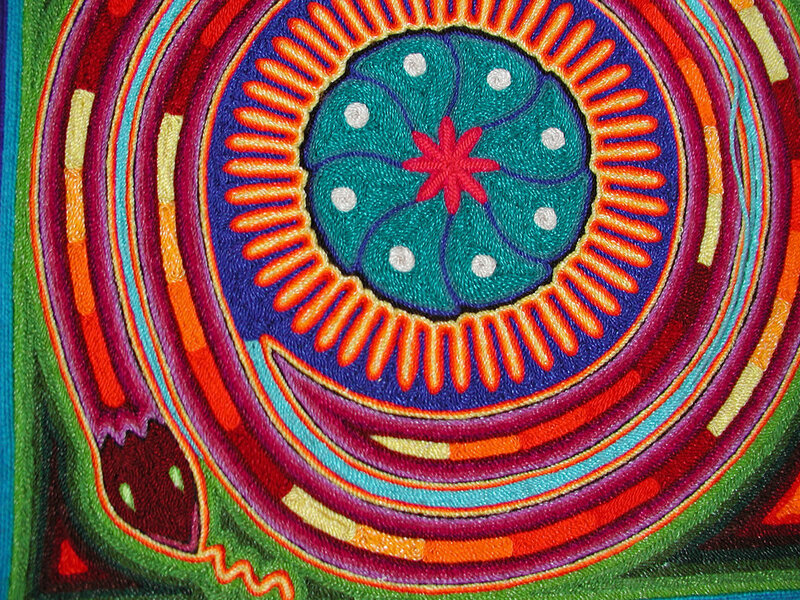 They make magnificently designed, colorful yarn art based on peyote visions, and have mostly maintained their culture for at least 2000 years. 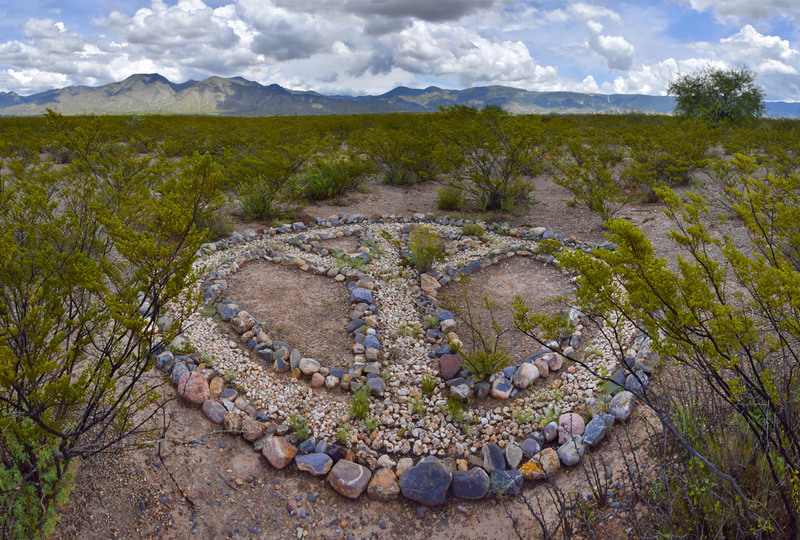 I'm told, that it's believed that the great Blue Deer diety, where it leaves it's tracks, is where the peyote grows. And, I believe their 4 principle deities include The Blue Deer, Corn, Peyote, and the Eagle. It's an interesting area with great spiritual significance to many people. The Huichol have an excellent museum in Zacatecas, with many examples of their art and culture. Anyway, it's a place I've been going to re-charge for several years now. Back in 2009, I started making a design in the dirt. Ended up scooting a peace sign in the dirt about 13 feet in diameter. When I returned, the wind had wiped it away, so I made another one in the same spot, and started adding large stones to outline it. Each time I went to the desert, I'd add more. When finished with the outline, I started adding small, white quartz stones to fill it in. This took much longer to find the smaller stones, but I just kept at it for some reason, every time I was there. And then I'd take photos of it as it progressed. Recently, I was there again... and finally finished filling it the design with the white stones. Took 4 shots to stitch together, and got GPS coordinates for it as well. Why? I have no idea. Or, Why not? Although a dozen copas of Mate de Coca got me through severe headache and malaise, the Peruvian altitude had nearly sucked the life out of me and I decided the Amazonian steam might better suite my constitution. I’d read of William Burrough’s Ayahuasca and thought maybe I’d snoop around the last jungle outpost of Iquitos for a guide to take me into the Amazon interior to meet a”qualified” Shaman to prepare me a glass or two. To my eyes, the Amazon women were consistently a sight to behold! The green eyes! The almond skin! The hot, wet air and distant primal calls from the far side of the Amazon river… beckoned me into her darkness. It didn’t take long to find an old chap who’d serviced a National Geographic expedition or two. He showed me old issues of National Geographic magazine clearly showing he’d been trusted by the big boys and after an afternoon of fee haggling I had a departure time. After a 3hr motorboat ride (one hour killed trying to get the stubborn outboard motor to cooperate) to “base camp”, another 4hr trudge through knee-deep jungle mud, another several hours moving through the sweet waters of the Colorado river to the Black River… we finally landed in a small hut strewn village. The next morning, my Shamanic host asked where the “guide” had disappeared to. My heart sank…. I had nothing but the clothes on my back, and nothing else. The Shaman sensed my panic and assured me the “guide” would turn up sooner or later, and he took me out into the jungle to show me various plants he used to cure. The Ayahuasca “trip” was the most difficult experience I’d ever had… swirling psychosis and violent expulsion. That evidently is part of the price to “see” with the Shaman. To me, falling out of a bamboo hut into the mud, and trying to get my pants off fast enough to “purge” from ALL orifices was not my idea of a swell time. But I went with it. The following morning, the Shaman insisted I “cleanse” in the Black river and that I prepare for the evening’s second dose… Still no guide… while “cleansing” I felt tiny nibbles about my legs that bordered on uncomfortable. I later found out that the Black River is teaming with Piranha, but that I needn’t be concerned unless I was bleeding. An Indian man, woman, and baby had arrived at the Shaman’s hut. The baby was ashen with a tinge of green about the skin… I’m no doctor, but that baby didn’t look like it was going to make it through the night, and a qualification of “living” seemed questionable at all. When the Shaman had finished his “treatment” he instructed the young mother to bring’em back in a couple days time and that he made need a follow-up treatment. He also gave her a small bottle of fluid from the middle reddish bottle you seen in the photo. He later told me it was for “female problems”. Two days later, still no guide, but the family returned with the healthiest looking baby I’ve ever seen. Pink! Laughing! And full of life! Where and how do you go to forge a new dream? Think I lost my dream somewhere along the way. Or, perhaps I never really had one to begin with. You get these ideas in your head at given points in time of what it is you think you want and then everything gets sorta put on autopilot. Could have sworn I had one, but somehow it either evaporated away, or was just an idea of the essence of "dream" without any details. One day... you ask yourself what you really want out of life and what your "dream come true" would look like. Trouble is, I don't have a clear and solid answer for that. Drawing a blank. I wander where one wonders to find a brand spankin' new dream? Or, is it just ok to be comfortable with whatever is happening in the now without the slightest concern for any particular "dream" or goal to be working towards?